Motorists could be soothed by roads that play a tune when passed over by vehicles driving within the speed limit. A road leading to Mount Fuji has been fitted with rumble strips that play a tune when driven over. The strips are paced at intervals that play a song called “Miagete goran yoru no hoshi wo” by Kyu Sakamoto. The suburu highway is one of three stretches of sonorous traffic calming in japan that play tunes in this way. The Japanese road has the benefit of being in a rural location. A similar musical road in California that plays a tune as cars drive over it is to be moved after local residents complained that the sound was keeping them up at night. The road reproduces sound in a similar way to a vinyl record; a succession of grooves are cut into the tarmac and the vehicle’s tyres act as the stylus. The stretch of musical road in Lancaster, California plays the William Tell Overture. Similar ‘melody’ or ‘singing’ roads have been built in South Korea and Holland. Local reaction to the singing road in America has been positive with the exception of local residents who tired of hearing the incessant music. It was eventually removed and reinstated on a stretch of rural road. Traffic calming is jargon for reducing speed; speed cameras and road humps are well known and not always popular, but subtle or temporary measures can be just as effective. People whose lives are blighted by speeding traffic occasionally take matters into their own hands to slow traffic in their community. Groups around the world have used imaginative methods to slow local traffic. Tactics ranged from tethering helium-filled balloons in the middle of streets where children play and installing fake speed cameras, to pouring concrete onto the road to create extended curbs at dangerous corners. 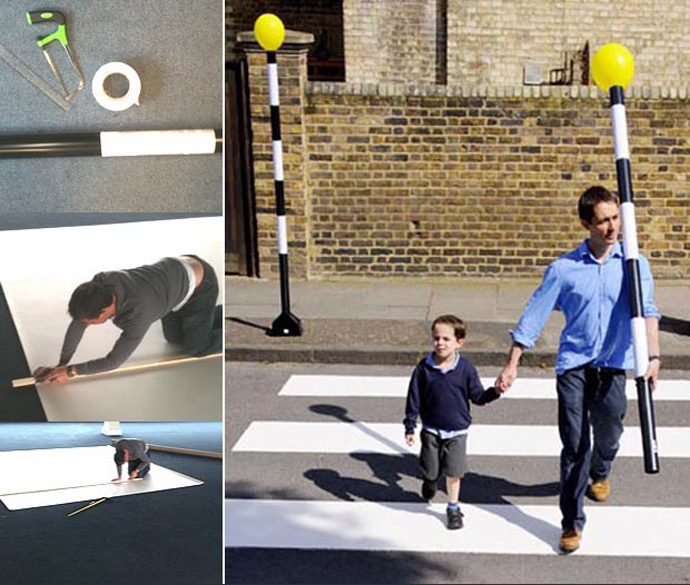 For our part, we designed and built our own pop-up zebra crossing to cajole local authorities into building the real thing outside schools. The ETA was founded 26 years ago to provide breakdown cover for motorists with environmental sympathies. Today we also sells fully comprehensive cycle insurance and travel cover. Concern for the environment remains central to all we do and is one of reasons we have been voted Britain’s most ethical insurance company by The Good Shopping Guide. Find out what makes us different. Every time you buy from us, you help fund projects like the pop-up zebra crossing and other camapigns to promote sustainable transport.